Welcome to Mrs. Holm's Class! 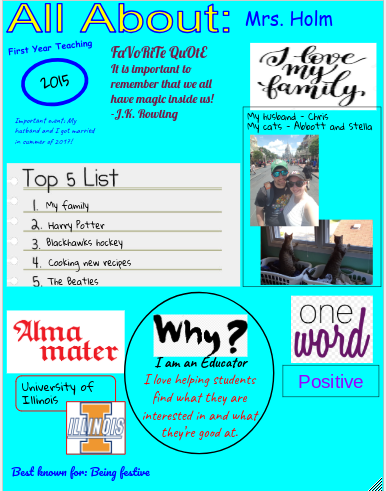 My name is Mrs. Jackie Holm and I am a third grade teacher. 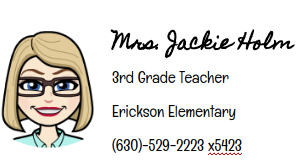 I began working at Erickson Elementary in 2013 as Miss Juhas. I worked as a third grade paraprofessional in 2013, the reading paraprofessional in 2014, and as a first grade teacher in 2015. I am very excited to be teaching 3rd grade for the third year! I went to the University of Illinois for my bachelor's degree in Elementary Education and graduated in the Spring of 2013. In my free time I enjoy spending time with my husband and family, reading, sewing, and watching the Blackhawks. I just got married last summer and am loving married life! My goal for teaching your child this year is to help them grow intellectually, emotionally, and socially. Third grade is a crucial time to develop important skills pertaining to both academics, with this being a year when testing ramps up, and socially, with this being a year where friendships begin to be cemented and are a more integral part of your child's school day.